The Yankees blew out the Kansas City Royals, 10-1, on Sunday afternoon to take two of three in the weekend series. The Yankees have now won 21 of their last 25 games to earn their 30th win of the season. Tyler Austin had two home runs and four RBI, while Austin Romine had three hits, including a homer, and two RBI. Sonny Gray had a great outing, as he went eight innings, and allowed just one run on four hits and a walk, with five strikeouts, to improve to 3-3. The Yankees routed the Red Sox, 14-4, to win two of three in the weekend series at Fenway Park. After Boston got a run in each of the first two innings against David Cone, the Yankees got to Sox starter Bret Saberhagen in the third inning. Chuck Knoblauch hit a three-run home run, followed by RBI singles from Tim Raines and Scott Brosius to make it 5-2 and chase Sabergahen from the game. Joe Girardi got a two-run single off Ron Mahay to cap the seven-run inning. The Yankees kept it going in the fifth against Mahay, as they put up six runs. It started when Dale Sveum had a sacrifice fly, followed by Knoblauch getting hit by a pitch with the bases loaded to force in a run. Derek Jeter had a two-run single, Paul O'Neill had a sac fly, and Bernie Williams had an RBI single that made it 13-2. Cone went six innings, allowing just those early two runs on eight hits and no walks, with two strikeouts, to improve to 6-1 on the season. 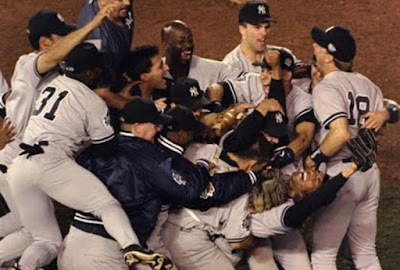 Where They Stand: The 2018 Yankees (30-13) are three games off the pace of the 1998 team, which was 33-10 through 43 games.